The Friends of Indian River saw continued growth in the scope and effectiveness of our work in 2016. Volunteer hours were up by more than 50% over the previous year, surpassing 1250 hours. 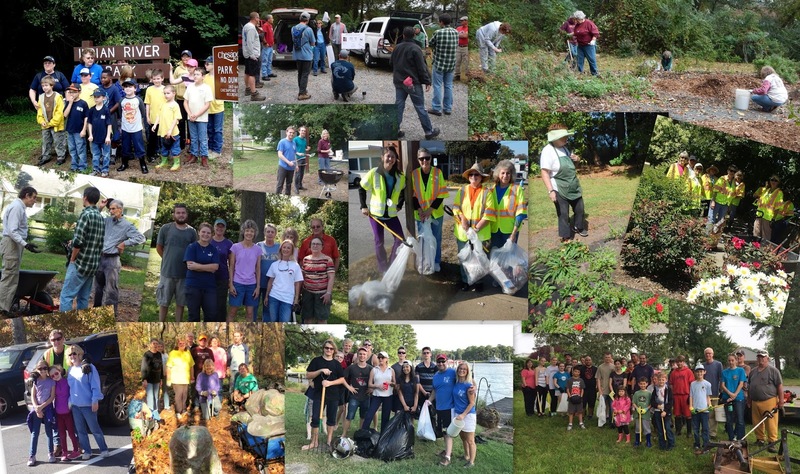 We added Plymouth Community Park to our Adopt-A-Park program, held a major BioBlitz event at Indian River Park, and hosted Clean the Bay Day events at each of these parks. We continued to work closely with the Elizabeth River Project on the Eastern Branch Restoration, including creating Oyster Reefs in the Indian River. Our group was instrumental in a successful grant bid by Chesapeake Parks, Recreation, and Tourism to get funds to establish a canoe/kayak launch site along the Indian River. And we continue to work on planning issues like the revitalization of the Indian River Shopping Center and the recently denied Eastwyck Crossing Apartments proposal. Our organization is entirely driven by our volunteers and we are immensely thankful for all their efforts. Their work is at the heart of all these accomplishments. We also wish to thank our many partners who have supported these efforts including the Chesapeake Departments of Parks, Recreation & Tourism, Public Works, and Public Utilities, the Elizabeth River Project (ERP), the Chesapeake Bay Foundation, the Chesapeake Master Gardeners, the Tidewater Master Naturalists, the Eastern Virginia Mountain Bike Association and others. The Friends of Indian River invite you to attend our Annual Meeting on Thursday, January 19, 7 pm at Oaklette United Methodist Church, 520 Oaklette Drive, Chesapeake, Va. 23325. We will hold elections for our officers and board and discuss plans for coming year. With the continued support of our members and volunteers, we will keep building upon our successes in 2017, which will also mark our group’s 5 Year Anniversary. Volunteers came out in force again this year, topping our previous year volunteer hour count by more than 50%. Our biggest volunteer efforts included two Clean the Bay Day sites, participation in the International Coastal Cleanup, and performing quarterly road side cleanups along Indian River Road. At Indian River Park, volunteers kept up the native plant garden and trailhead entrance area, performed trail maintenance, and put in extensive efforts to control invasive species, particularly English Ivy and Japanese Stilt Grass. Our volunteers also worked to keep the gardens and trees at the Indian River-Oaklette Bridge looking beautiful. And hundreds of hours of behind the scenes work was done to coordinate with the City, the Elizabeth River Project, and other partners, perform outreach, and keep the organization up and running. On April 16th, the Friends of Indian River hosted the first ever BioBlitz at Indian River Park, an event both educate the public about the natural features of this urban wilderness and to identify as many species of plants and animals as possible. Several groups worked together to make the BioBlitz a success, including the Chesapeake Parks, Recreation & Tourism (PR&T), the Tidewater Master Naturalists, the Chesapeake Master Gardeners, Boy Scout Troop 42, and the Tidewater Master Naturalists. 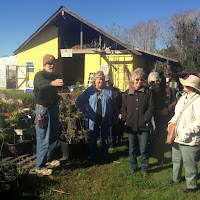 Wildlife experts were recruited from the Cape Henry Audubon Society, Old Dominion University, the Virginia Department of Forestry, the Virginia Department of Game and Inland Fisheries, Chesapeake PR&T, and the Virginia Cooperative Extension Office to provide guided hikes. Altogether, 84 people participated in the day’s activities including 22 youths. Over 9 hours and 6 guided hikes, 116 species were reported including squirrels, salamanders, the Eastern Kingsnake, 21 species of birds, 24 species of insects, spiders, and other “bugs”, 61 species of plants, and 7 invasive species. These discoveries brought the total species count for the park to over 300. The full BioBlitz report can be found at https://drive.google.com/file/d/0B1C5n48ReRbkS1VwLUNjRnJjbDA/view. The tidal Indian River has nearly 9 miles of shoreline and 60 acres of marsh with a diverse cross-section of wildlife. However, unless you live along the water, there is no practical public access to the river and certainly no public canoe/kayak access. The Eastern Branch Restoration Strategy identified this lack of public access as a key obstacle in getting citizens to care about the health of the river. The Friends of Indian River, working with the Elizabeth River Project, the Norfolk Highlands Civic League and the Chesapeake Parks, Recreation and Tourism identified a potential public access site. And this summer, with backing from these groups, the City won an $182,500 Virginia Land Conservation Foundation Grant, with City matching funds, to acquire the site. We expect the purchase to be completed in 2017 and progress to open the site to follow quickly. 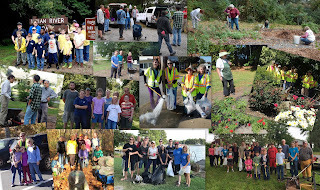 This year, the Friends expanded our efforts to Plymouth Community Park on the west side of the river. This small 4 acre park has long been overlooked and the Friends have Adopted the Park to help make it a useful asset to the community. We held a Clean the Bay Day event at the park in June and followed up by holding our International Coastal Cleanup there in September. Between the two events, volunteers removed over 1250 lbs. of trash that had accumulated over decades of neglect. The City is stepping up too and is installing picnic tables, new signage, and is considering future plans for a playground, pathways, and a river overlook. Three members of the Friends of Indian River went through the permit process to install oyster reefs along their Indian River waterfronts. The Elizabeth River Project, in cooperation with the Chesapeake Bay Foundation, laid down 180 cubic yards of oyster shells creating one large and two smaller oyster reefs near the mouth of the river. Next year we’ll see how much natural recruitment of “baby” oyster spat occurred on the reefs with the goal of accelerating oyster recovery along the river. Another goal from the Eastern Branch Restoration Strategy was to eventually create a bike route around the Eastern Branch from downtown Norfolk to Indian River Park to Kempsville and then back to downtown along the north shore of the river. 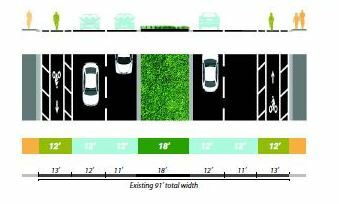 In late 2015, Norfolk approved its new citywide Bike Plan that calls for establishing dedicated bike lanes along Indian River Road. The Friends engaged the Chesapeake Bicycle and Trails Advisory Committee and they also endorsed the concept of extending this route along Indian River Road in Chesapeake to the site of the planned canoe/kayak launch and then through Norfolk Highlands to Indian River Park. Eventually the route, if built, would follow the Dominion Power Line corridor onward into Virginia Beach. Many of the above actions are parts of the larger Eastern Branch Environmental Restoration Strategy developed by Elizabeth River Project along with multiple regional partners including the Friends of Indian River. This year the Elizabeth River Project was awarded a $750,000 grant to further advance the effort. The Friends of Indian River will continue to participate in the planning and execution of the plan to improve the health of the Indian River and its surrounding communities. The Friends continue to follow and provide input on the negotiations between the City and Aqua Virginia regarding the water service to the Indian River Shopping Center and the neighboring residential area. At the end of year, there is a proposal establish cross-connections between the City and the Aqua water systems to allow the City to provide backup water supply to the system in the case of emergencies. This would stabilize the system in the event of power outages and enable Aqua Virginia to install fire hydrants in the community in phases. The City would also be allowed to provide a direct connection to the Shopping Center for fire suppression water supply, removing the key barrier to redevelopment. But Aqua Virginia is not interested in selling their system and would remain the primary water provider to the community. For a more thorough description of the proposal, see http://www.friendsofindianriver.org/2016/12/aqua-virginia-update.html. Additional public hearings are expected early next year. The Friends sponsored an education field trip to New Earth Farms in Pungo, Virginia Beach to learn about the how and, perhaps more importantly, the why of sustainable farming. The 21 acre farm is a classroom and laboratory working to protect the living soil, eliminate chemical use, maintain seed diversity, and raise farm animals in a way that is healthy for the animals and the environment. The City Council denied the application to build the 240 unit Eastwyck Crossing Apartments on a 17 acre wooded lot adjacent to Indian River Park. The Friends had raised concerns that additional environmental mitigation was needed on the site and about the impact to the already overcrowded schools of our area. But do note that the developer does have pre-existing approval to build 208 condos on the site and their future plans are TBD. The Friends continued to engage local civic leagues including the Norfolk Highland Civic League, the Georgetown Civic League, the Campostella Square/Plymouth Park Civic League, and the Ipswich Townvilla Association. The Friends continue to track progress on the renovation of the old community center at the Providence Playground which will house the new Rokeby Senior Center. Opening is now planned for early 2017. And please remember to join us for our Annual Meeting on Thursday, January 19, 7 pm at Oaklette United Methodist Church to discuss plans for 2017. It is starting to feel a lot like Christmas! And our big Annual Holiday Party is on December 15th. We very cordially invite all our members, volunteers, and their guests to come join us for our year end celebration. We'll recognize our wonderful volunteers and all their great accomplishments, share holiday treats, socialize ... and do some shopping! The party features our big silent auction, always brimming with some quality items donated by our members. Even if you have not been to a meeting in a while or if this would be your very first meeting, we encourage you to come out and partake in the merriment. The party is from 7 pm to 9 pm at the Oaklette United Methodist Church. Please bring a desert to share and join the festivities. Also, the Oaklette United Methodist Church food pantry will be collecting donations of non-perishable food items. This will be our end of year celebration to recognize our many accomplishments, recognize our volunteers, and socialize. Please bring a desert to share and join the festivities. We'll have a silent auction, so you can finish some Christmas shopping too. Please also consider bringing a donation of non-perishable food items for the Oaklette United Methodist Church food pantry to the meeting this evening. At the Civic League meeting in early October we heard from David Jurgens, Director of Chesapeake Public Utilities and John Aulbach, the new President of Aqua Virginia. We also received the same input from Mr. Jurgens at the Friends meeting later in the month. The City and Aqua Virginia have been in negotiation for approximately two years and they outlined a proposal to address the water quality and fire protection issues in the Aqua Virginia service area. What we heard was that, if agreed upon by the City Council, the proposal would within 12 to 18 months 1) establish cross-connections between the City water system and the Aqua water system to allow the city to provide a BACKUP supply to provide water and pressure to the system in the event of power loss and/or to support fire fighting, 2) allow the City to directly provide an emergency water line from its 12" main pipe along Indian River Road to the Indian River Shopping Center to enable fire suppression/sprinkler systems in the center, 3) have Aqua Virginia install fire hydrants within its service area that has 6" cast iron pipes, generally the area between and including Linden Ave and Sparrow Road. Then over the next 5 to 7 years 4) Aqua would perform a capital construction improvement process to replace its oldest 2" to 4" galvinized pipe network and provide fire hydrants in its remaining service area, i.e. the area between Sparrow Road and the Virginia Beach line. The proposal would resolve the fire protection issues, including for redevelopment of the Indian River Shopping Center. The proposal would address some of the water quality issues and would not require major rate increases for customers. The presenters indicate that a key cause of the water quality issues is the corrosion and sediment build-up in the aging pipe system, especially the very old galvinized pipe network: water pressure fluctuations especially stir up this contamination causing the "brown water" to flow to residents. The cross-connection to the city will provide a backup water supply if power is lost to the system, reducing the problem related to water pressure fluctuations. The ultimate replacement of the galvinized pipes will remove a major source of contamination. Aqua Virginia also said it would investigate cleaning the less old 6" cast iron pipe system, although the feasibility of this was unclear. We heard that the possibility of have Aqua exclusively purchase water from the City, rather than relying on well water, is also under consideration, but whether is financially viable for Aqua is to be determined and it does not in itself address the problem of the aging pipes. Aqua Virginia was also quite clear that they have no interest in selling their system to the City. The next steps include gathering further public input and finally taking the proposal to the City Council.